Pace Bunny* registration is for runners who are interested in pacing a group of runners. Race Day** Registration includes taxes. 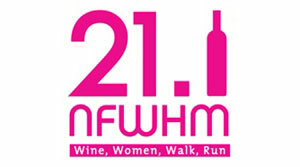 For race information visit the NFWHM website - Click Here. Friday, May 31, 12noon - 7:00p.m. Saturday, June 1, 10:00a.m. - 4:00p.m. Half Marathon Run/Walk : Sunday June 2, 2019 @ 8:00 A.M.
5K Run/Walk : Sunday June 2, 2019 @ 8:00 A.M.